After a a long (6 hour) ride from Erfoud to Ouarzazate we didn't have much trouble finding a suitable hotel. Our Lonely Planet guide book proved to be quite handy once again. This time Hotel Royal was our choice. It proved to be OK but not much more. 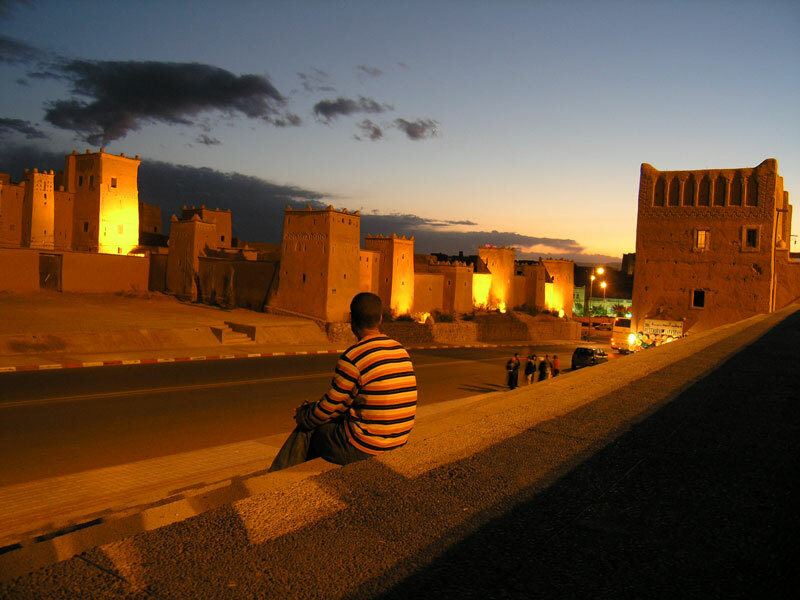 It was still early when we got up and headed for the Ouarzazate Grand Taxi station on the next morning. We were expecting another bargaining session and we were right. As soon as we got there we found someone who would be very happy to take us to Ait Benhaddou. This was our destination of the day. I thought it would be easier to lower the starting price for the ride there and back. The story was, M. and I would have to pay for all six (yes that's 6!) 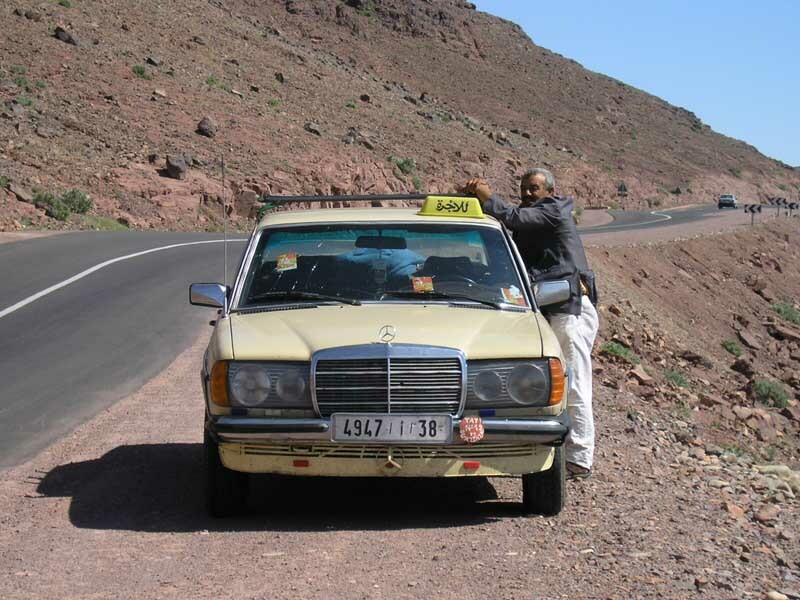 places in an old Mercedes (you can read more about grand taxi habits in Morroco in this post). Although many of the drivers standing around were assuring us that definitely there were no other passengers going our way, we decided to hang around for a bit longer and wait for someone willing to share a ride with us. We didn't have to wait long. Soon a foreign looking group of three stepped out of a petit taxi. We approached them before anyone else started talking to them. As we expected, they were also heading our way and it didn't take us long to arrange a ride. During a ride to Ait Benhaddou in an old Mercedes we learned, that father and daughter of Korean origin were coming from US and have a local guide with them to show them around. 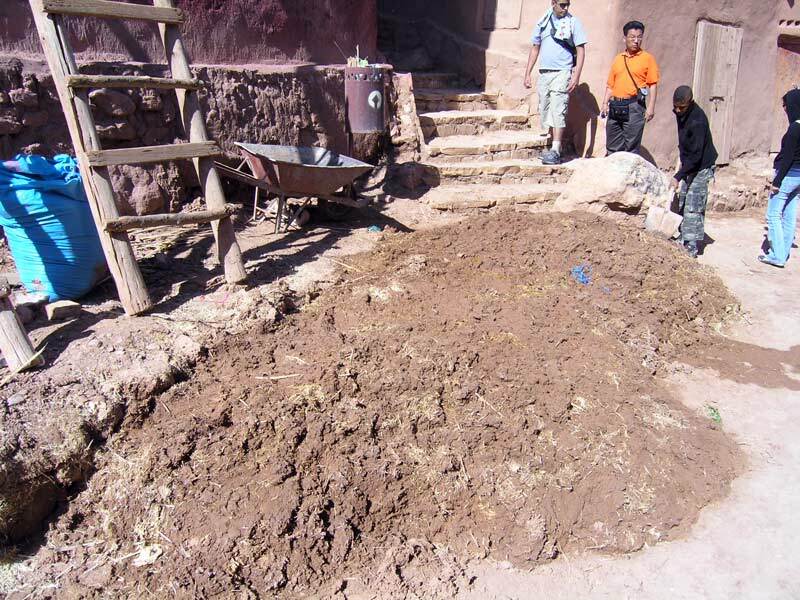 We were told he was a friend of a friend and a really valuable asset when traveling around Morocco. After a photo stop or two we arrived to our destination and went on a quick tour around the city made out of mud. It was quite interesting and soon we realized residents are probably never bored. The walls have to be constantly repaired - they are damaged every time it rains. Luckily that is not too often. We saw a group of locals preparing the muddy mix. Most walls are obviously made from such a mix of mud, water, straw and supported by wood. Supposedly only nine families live in the mud city today and they are trying to keep it in a reasonably good shape. This UNESCO site is often used as a movie set and is quite famous. On the way back we passed Atlas Studios and we decided to check it out. They offer guided tours around most of the movie sets still standing today. Some of those are really old (for instance the F16 airplane from the 1985 movie The Jewel of the Nile is in a pretty sad state), others were reasonably new. We also saw other famous movie sets (Gladiator, Asterix & Obelix: Mission Cleopatre, Kundun etc.) of which the most fascinating was a real-size castle for The Kingdom of Heaven. Supposedly it was built for 20 minutes of the movie. Despite a 50 Dirham entrance fee per person and a pretty touristy feel to it, we still liked it (after all it was the single one attraction of this type on our three week trip). Potential visitors beware: Because of the price and at moments a bit industrial feel to it, some of you might see Atlas Studios as a tourist trap. After a quick tour of the studios (our guide was constantly rushing us from set to set) we caught a city bus to our hotel. After a quick stop we went out to grab something to eat. 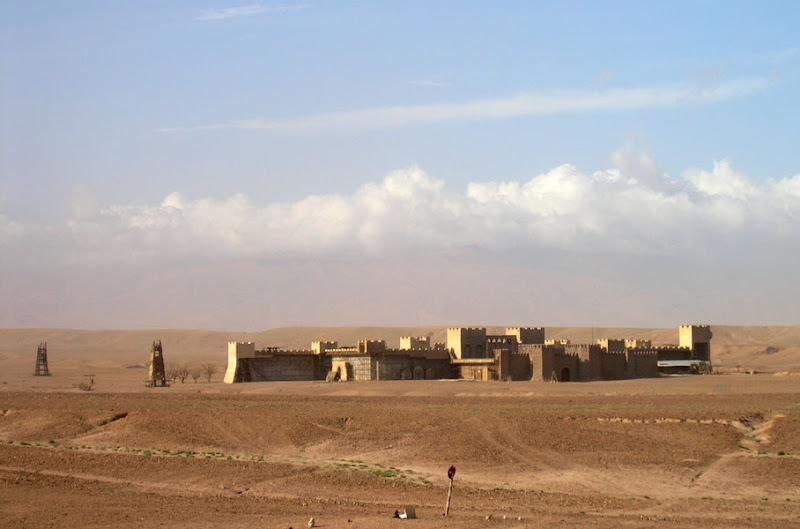 Since we still didn't have enough of attractions for one day, we walked to the city Kasbah. 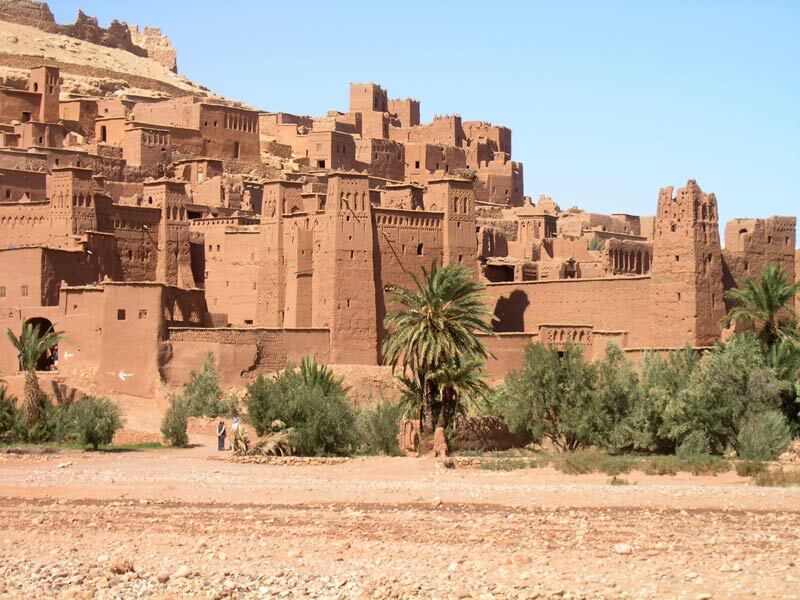 Kasbah of Ouarzazate is supposedly the largest in Morocco. It truly is magnificent! After this we were really exhausted and literally fell into bed. We slept like dead until the morning. I'm really enjoying your photos. I'm glad you had a chance to post again! Thanks. As you might have noticed, I just don't have much time lately. Simply so much to do and so little time. Luckily there is still lots of material waiting to be published.